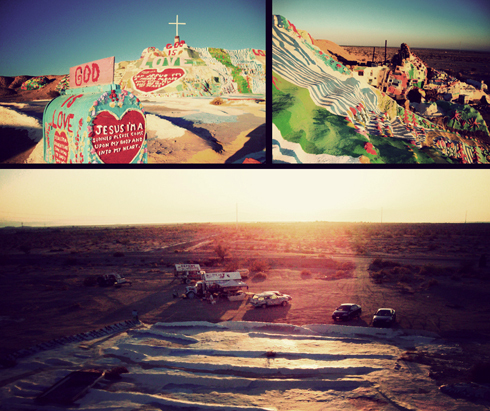 Day Five (08.27.09) Of all the places we visited, Salvation Mountain was the one that made me realize I was never going to forget this road trip. Much like the Salton Sea in general, this man-made mountain of paint is so incredibly different and unique, it's almost dream-like when you find yourself practically alone in a setting like this. 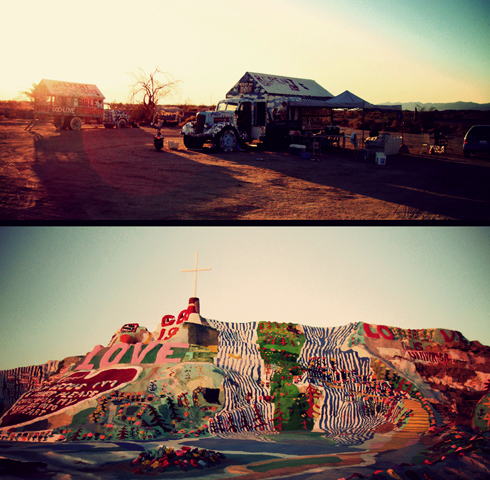 Created by Leonard Knight, I first came to know of Salvation Mountain from the movie Into the Wild. There's a scene where Emile Hirsch's character is given a tour by Knight and I was captivated. I never really pictured myself getting there necessarily, but it's funny how those plans came together - how my interest in Indio lead to the Salton Sea which lead to Salvation Mountain. Another interesting fact about this site is that it's built on government land and for years had been threatened with removal. 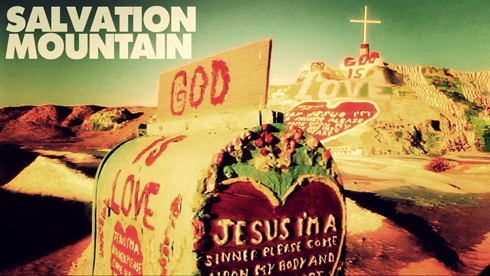 Until 2002 when senator Barbara Boxer took interest and helped Salvation Mountain gain special designation as a national treasure - an honour held by only one other landmark, Mount Rushmore. The coincidence in this is that the last major road trip I went on before this one was to Mount Rushmore - you can see the edits here. Dave and I took full advantage of the experience. When we arrived Leonard was giving a tour to a group of girls, and we all met up as he told us we could walk the yellow path up to the top of the mountain if we wanted to. Naturally we said yes, we had no idea he'd let us walk on his art, but when considering how hands-on the construction must've been there's really no better way to experience it. We walked the winding path, marveling at the intricate details (like the litte coloured flowers) and were rewarded with a spectacular view at the top. The setting sun gave the desert a rich golden hue, and the colours of Salvation Mountain only looked further saturated by the contrasting monochromatic landscape that surrounded it. There were miles of desert, hills, and small glimpses of civilization. 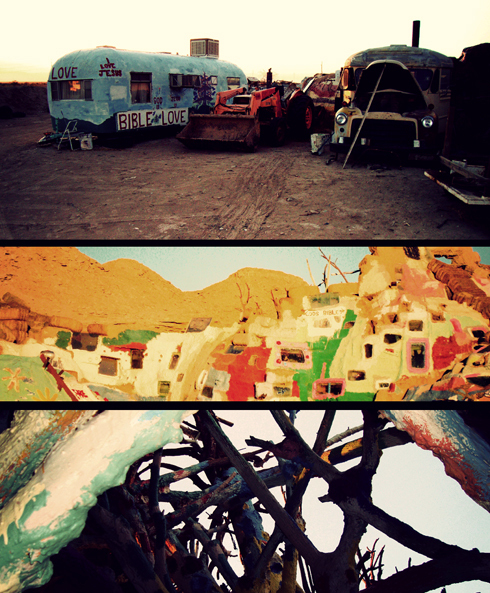 None more present than Slab City - a community of nomads, off the grid. But ultimately, it was quiet and refreshingly secluded. A scene that almost forces you to be alone with your thoughts; comfortably at peace. 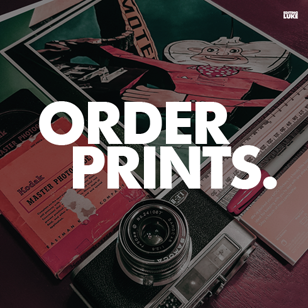 While the messaging (God is Love, etc.) is strong, and the display eccentric, there was nothing scary about Leonard himself. If there was one word I'd choose to describe him it's passionate. He really just wanted to make his mark, to express love, and devote his life to a higher purpose - whether religious or not you have to value his commitment and vision to make a positive impact. After we came down from the mountain and had our private look around, we approached Leonard to talk (see the next video). I'm still pinching myself that several thousand kilometers from home we found ourselves talking casually, face to face, with the man who built this hidden treasure in the middle of nowhere.